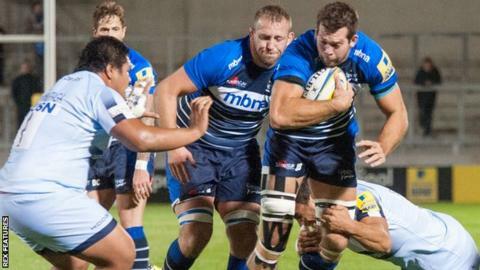 Sale Sharks' first win of the season, against Worcester, came after a "torrid week" at the club, says director of rugby Steve Diamond. The Sharks were thumped 41-3 at Saracens in their Premiership opener but responded with a bonus-point win against the newly promoted Warriors. Diamond told the Manchester Evening News he hid in his house for 36 hours following the defeat by Saracens. "We got beat last week and you put it behind you," the 46-year-old said. He told BBC Radio Manchester: "The squad have had a torrid week, we've all had a torrid week, and we don't play until a week on Sunday now, so the last thing we wanted to do was go a fortnight without a win. "It was important that we responded and they responded exactly as we asked them - they played the way we said we were going to play."